I loved Autozone Park the first time I ever saw it. It's got the perfect location - one block off Beale Street, right in the heart of downtown. If you stand in the outfield and take a picture you can get a great shot of the Peabody Hotel sign in the background looming over the stadium (I took a great picture of this and, of course, lost it.) It's got the classic red brick exterior that has become so popular that it sometimes looks silly, but in this case fits in with the surrounding buildings. And it's big. It's one of the largest minor league stadiums I have been in. 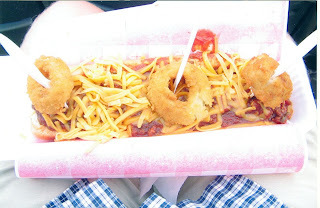 And, I had the best concession stand item I have ever eaten: a footlong hot dog covered with chili and cheese, impaled with three forks, each ringed with a beer-battered onion ring. I started to get heartburn about halfway through the dog. But it was totally worth it.